Spa Day @ the Library! If you’re a teen who will be near the West End Library on Wednesday, stop in to get pampered! There will be he normal Teen Lounge stuff – Xbox, Wii, Art Corner, and snacks, but you can also make a body scrub from scratch – this sugar-based concoction will make your skin smoother if you’re into that. You can take home easy skin care recipes to make from stuff you probably have in your own kitchen. This could be a great Mother’s Day gift, too! It’s from 4:30-6:30 and is FREE as usual. Check out the event page by clicking here. By now, I hope you are all familiar with the graphic novel/manga section of your library (and the wonderful subject heading of graphic novels.) If you’re not, and feel overwhelmed by the sheer number of comics and graphic novels out there, these lists are a good place to start. But that’s not really what I want to talk about today. I’d like to talk about the weird and wonderful world of webcomics (WaWWoW) (that’s not a real initialism). When I first stumbled on webcomics RSS feeds were just being invented, so I had to go back to my favorites every day and check to see if they’d been updated. 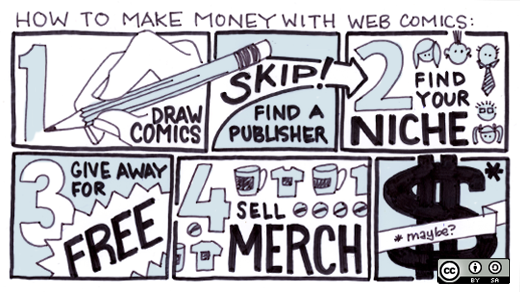 Since anyone can make and post a webcomic online for not very much money (or free if you don’t use much bandwith and free blogging software), the number of comics was huge and the quality hit or miss. The best way that I found to find new webcomics was to look at the links on the pages of my favorite author/artists. At a certain point this became recursive, since they all linked to each other. I still read some of these comics today – they’re still going strong and have gone through who knows how many plotlines and name changes and drawing styles. That’s one of the great things about webcomics – you can see an artist’s style evolve and become better and better. Webcomics from the old days of the new millennium! The current cast is a group of (British) kids solving mysteries and it’s so good. John Allison (the writer & artist) is also the reason that I learned about Kate Beaton, history comics funny lady extraordinaire, so he obviously has good taste. This comic is like if Friends were set in hipster post-college Massachusetts and everyone was more awkward. Clip-art style dinosaurs being absurd. it’s easier to find an even vaster variety of comics online. Comic big-name Warren Ellis serialized his science-fiction story Freakangels, about a group of teenagers whose strange telekinetic powers destroy the UK, for free, online, and published it so it could be bought by people and library systems like our own. Now there are sites devoted to groups of serialized comics, like Study Group, with indie/underground style artists, Activate Comix, founded by Dean Haspiel, Saturday Morning Webtoons, aimed at younger readers, and ShiftyLook, with more superhero-themed offerings. Comics veterans like Sam Hurt have uploaded their archives online, while artists of the digital age like Derek Kirk Kim, Hope Larson, Bryan Lee O’Malley, Krystal DiFronzo, Peter Quatch, and Amelia Onorato have a blog or tumblr as a matter of course. Or in the Outstanding Online Comic category of the Ignatz Awards which will be decided at the Small Press Expo in Maryland. Jillian Tamaki’s excellent Supermutant Magic Academy was nominated! I’ll be attending this year to find new and old favorites, because I can’t get enough. Neither can you? Then start clicking on the links and read on! (All the images will go to the webcomics cited). There are so many that I’m sure I missed a ton – what’s your favorite? Calling All Comic, Graphic Novel, and Manga Readers!!! The nominations for YALSA’s 2012 Great Graphic Novels for Teens list have been finalized! All year I’ve been reading all the new graphic novels, superhero stories, and manga I can get my hands on to evaluate and nominate titles, because last year I was selected as a committee member for this list. But the committee doesn’t just need my opinion. We also want to hear what you think about the titles that have been nominated to be on the list. Our final discussions will take place during the ALA Midwinter Conference. That’s on January 20-24 of next year. That still gives you time to read some of the books and send me your thoughts. Many of them are available from the library! But some of them are so new we haven’t even gotten them on the shelves yet. However, I have copies! The opinions of actual readers are so helpful to us when discussion time comes around. So please lend me your voice and help us select the books that will end up being Great Graphic Novels for Teens 2012. Once again, the list of nominations can be found here. And below you’ll see a sampling of some of the covers of the nominated books. If you’re anything like me, you might crave some alone time away from the family this Thanksgiving holiday (or you may just want to skip out on helping with the dishes). Here are some fun ways to occupy your time, allowing you to create your own animations, on your computer or smart phone. Scratch is a programming language developed by MIT “that makes it easy to create your own interactive stories, animations, games, music, and art — and share your creations on the web.” It’s free to join and share things. Once you create a Scratch project, people can interact with it or download and remix it. For example, someone has made a calculator using Scratch! You can also make games to play – there’s a gallery here. And if you get stuck, there’s a Support page and Forums. Unfortunately, this is only available as a Nintendo DSi program, but you can also browse and watch the Flipnotes that others have created using their DSi. Since the program is available worldwide, there are many international Flipnotes, and it could be a fun way to practice your Japanese! For those of you who took our Quick Flix workshops, taught by awesome people from Pittsburgh Filmmakers, I have some free Stopmotion and other animation programs! These require some downloads and tutorials, but could take your filmmaking to the next level. This has how-to videos, a newsletter, video interviews with animators and free motion capture software for download. It was created by animator Mark Spess, who taught himself to do stop-motion and thought there should be a place online for fellow animators to learn and share their craft. This software is based on the Anasazi software from the Animate Clay website, and can work with a built in PC camera or digital camera connected to your PC. Before you start out on your journey, you can always use your local library to do some basic research on making animation! LBPH: so what goes on in there? Last Thursday I got to do some cross-training at the Library for the Blind and Physically Handicapped. No, not the kind of cross-training that involves a stationary bike and a treadmill. Librarian cross-training means that we get to see what goes on in different departments and branches in the system. This means that they have a really cool freight elevator and lots of storage space for their collection. 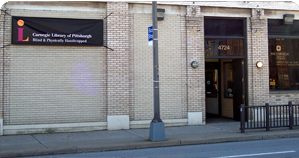 LBPH is different than all the other libraries in the Carnegie Library of Pittsburgh system. While the rest of us serve the residents of Allegheny County (and the city of Pittsburgh in particular), LBPH serves half of the state. That’s 36 counties! They get extra money from the federal and state governments because they’re also part of the National Library Service for the Blind and Physically Handicapped (NLS). Aaaaand… they serve ALL AGES. Including teenagers. In most cases, except for reading disabilities, a librarian can even certify you and sign you up. Otherwise you’ll have to get the signature of another certiying professional (like a doctor or nurse). LBPH also provides really in-depth, specialized services for their customers. They don’t just have large print books. They have a huge collection of special cassettes, and a growing collection of digital books on flash drives. Plus the NLS offers a downloadable catalog of hundreds of other digital books once you are a certified user of LBPH. If you go to their catalog and search for “young adult fiction” you can see for yourself how many great, up-to-date titles are available. Titles like the Good Girlz series by Reshonda Tate Billingsley, the Octavian Nothing books by M.T. Anderson, V.C. Andrews books, fiction anthologies and more. The librarians and library assistants at LBPH create a specialized profile for each of their customers that lists what authors, subjects, and formats that they like, really like, and never want. They give each customer a cassette or digital player free for use, and everything is sent free through the postal system. So if you or anyone you know would be eligible for the services of the LBPH, by all means take advantage of it! Come into the library and sign up, or give us a call. Or, if you’re a budding dramatist or sound engineer, you can volunteer to create digital recordings of books at LBPH… they hold auditions all the time. The phone number is 412.687.2440. ***Hello Bloggers!!!!! My name is Ciana Gaines. This summer I’ve chosen to intern at The Carnegie Library – Homewood Branch. This opportunity was presented by an non-profit organization called Urban Youth Action (UYA) located in downtown Pittsburgh, who pays me to work at the library! Urban Youth Action is a organization for teens, ages 15-18, that helps you to be work ready, and ready for the world after you graduate from High School, which I have done. It is a fun and helpful way of learning and an opportunity to make new friends. Many different kinds of teenagers, from all types of schools, participate in activities that we are fortunate to get for free. Also, since downtown isn’t as close to many of people’s homes, they give you bus tickets to get there and back whenever you decide to come in. All of this is only if you sign up and are a part of the program. Along with the educational outlook there are also optional field trips and community service projects for you to participate in. The best thing of all is that there are presenters and/or speakers that come in twice a week (depending on what age range group you are in). They talk about what their career is and give you a little more information on what they do and how they became a part of it. Another thing that happens once a week is an academic enrichment class. This class is only a hour long before the presenters and/or speaker arrives. The teachers of the academic enrichment classes are college freshmen, juniors, or seniors. They taught me certain college math skills and helped me review what I already knew from High School. Another thing that they did was gave us summaries of college reading passages. The most important thing about the classes is that every time you go you get five dollars and after a month or two that could add up to be enough to get whatever you had your eye on at the store. Overall sometimes the class was boring sometimes it was fun, the best thing about it is that I actually learned things that I would need in and out of school. I never really realized how much I learned from participating in this program until now. In my opinion, Urban Youth Action has something different to offer every person that takes part in the opportunity and if you take the time to sign up you will soon see it was well worth it. Posted on April 29, 2008 by Corey W.
Phantom of the Attic @ 406 South Craig St. in Oakland. Open 10 AM to 7 PM on Saturday. The Copacetic Comics Company @ 1505 Asbury Pl. in Sq. Hill. Open 11 AM to 5 PM on Saturday. Eide’s Entertainment @ 1121 Penn Avenue, Downtown. Open 9:30 AM to 6:30 PM on Saturday. And remember, comics are always free at the library! We’ve got thousands of graphic novels, manga and zines to choose from. Stop by the teen desk and we’ll recommend something great.